Its extensive pine forests and fine beaches are the main tourist attractions. 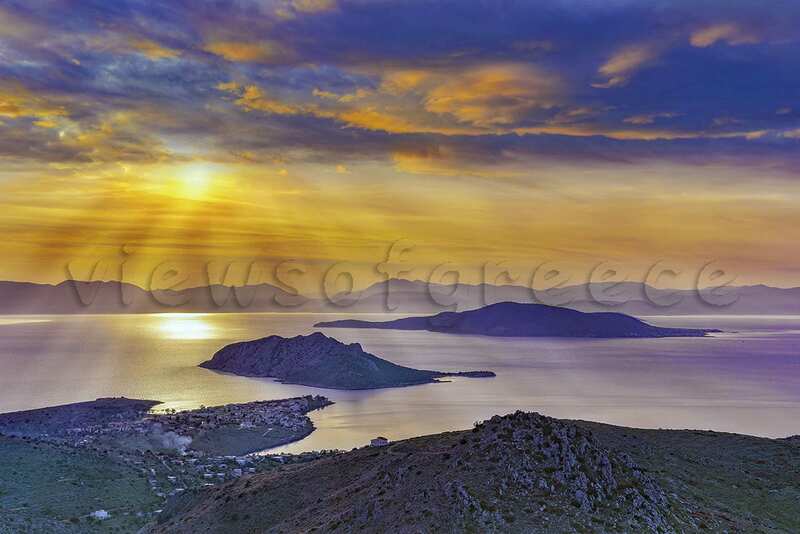 The voyage from Piraeus to Aegina – the island’s port and capital – or to the village of Souvala lasts 45-60 minutes. Although a large part of the coastline is built, the capital with its lovely neoclassic houses, its picturesque port and the church of Saint Nicolas still retains something of Aegina’s old genuine personality. According to Greek mythology, the island takes its name after the nymph Aegina, mother of Aeacus, the offspring of her relationship with the Olympian god Zeus. Aeacus was the first king of the island and also the grandfather of Achilles, the Trojan War hero. The inhabitants of Aegina were always seafarers. Their nautical activity led the island to a flourishing trade and during the 6th and 7th century BC at the height of prosperity. Proof of this heyday was the minting of the first silver coins in Greece bearing the image of a tortoise. Before you start swimming, walk in the alleys of Aegina’s old town which was for a short period of time the capital of the newly established Greek state. Look for the houses where great Greek politicians lived, like Trikoupis, Kountouriotis (19th cent.) and Kanaris – a hero of the revolution against Turks(1821)-. The tower of Markellos where Kapodistrias, the head of the newly formed free state of Greece, established his Government House(1826-29), operates now as a cultural centre. The archaeological museum has a rich collection of exhibits (22970 22637). To the left of the port on the site of “Kolona” you can visit the ruins of the ancient Peripteral (derives from the Greek “pteron”=external colonnade) Temple of Apollo (6th cent. B.C.) +30 22970 22248. Ancient temple of Afea Athena: It is located on the road between Aegina- Agia Marina, on the top of a hill offering a magnificent view to the Saronic Gulf(archeological site 22970 32398). 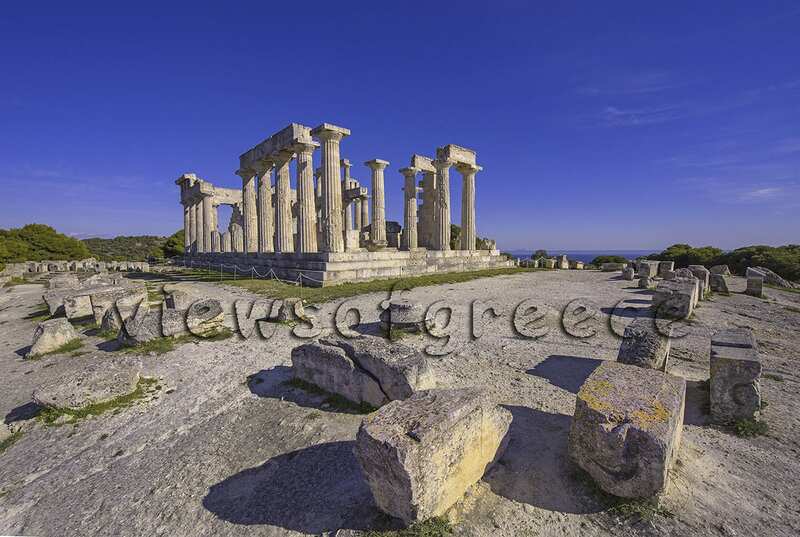 The initial temple built here in 570 BC, was dedicated to Afea, an unknown goddess of the time, patron of the island. In 510 BC it was ruined and rebuilt later on, in honour of the ancient goddess Athena. The superb sculptures removed from its pediments by the British Cockerell and the German Hallerstein (1811) when Greece was still under Turkish occupation, are nowadays exhibited in Munich’s Glyptothek museum. In Aegina bathe at the sandy beaches Kolona and Plakakia. On the road to Perdika village at the crowded shores Marathonas and Aeginitissa you will find taverns by the sea. There are small boats departing from Perdika to the neighbouring island Moni, featuring the cleanest shores of the Saronic. After a short drive on an asphalted road, you will discover the enclosed bay Klima with its sandy beach shaded by eucalyptus and cypress trees. The beach of Agia Marina is the most popular of the island as it’s perfectly organized for water sports. At a distance from Aegina to Souvala you will come across small sandy bays with shallow waters. The best inland route is the one connecting the town of Aegina with Agia Marina. The road twists and turns through marvellous pine forests and after 13 kilometres reaches the most popular resort of the island, Agia Marina. A walk at the ruins of Palaiohora, the medieval capital of Aegina, will be an unforgettable experience. From the neighbouring village of Mesagros with its great tradition in pottery, you will head on to the temple of Afea Athena and end up at Agia Marina. The stately capital Romantic promenades in castles and old alley-ways, dives in beautiful beaches and pleasant short excursions in one of the most historic cities of Greece!